Be the first to share your favorite memory, photo or story of Arvilla. This memorial page is dedicated for family, friends and future generations to celebrate the life of their loved one. Arvilla A. Beccue, 93, of Altamont passed away peacefully at 10:02 a.m., Monday, April 1, 2019 at HSHS St. Anthony’s Memorial Hospital, Effingham. Funeral services will be at 11:00 a.m., Saturday, April 6, 2019 at Immanuel Lutheran Church, Altamont with Rev. Dr. James F. Wright officiating. Burial will follow at Immanuel Cemetery. Visitation will be from 5-7 p.m, Friday, April 5th at Gieseking Funeral Home, Altamont and for one hour prior to service time at the church. Memorials may be made to Immanuel Lutheran Church. Arvilla was born on Wednesday, October 14, 1925 in the Bethlehem Community, rural Altamont to William and Matilda (Zander) Trost. She was baptized into her faith in Bethlehem Lutheran Church on October 25, 1925, by Rev. F.W Brockman and was confirmed on April 2, 1939, by Rev. Martin Potts. She married Clarence William Beccue on February 14, 1953 in Mattoon, IL and he preceded her in death in 1994. She was a member of Immanuel Lutheran Church, Altamont. She is survived by: sons, Dale Beccue and his wife Shelby of Forest, VA, Dennis Beccue of Tulsa, OK, and Dean Beccue and his wife Donna of Spring, TX; two grandchildren, Derek Beccue of San Marcos, TX and Lauren Beccue of Washington, D.C., and many nieces and nephews. Arvilla was preceded in death by her parents, her husband, brothers, Carl and wives Irene and Laverne Trost, Raymond and wife Eileen Trost, and one brother in infancy; two sisters, Eleonore and husband Arthur Winter, and Wilma Trost-Reich. 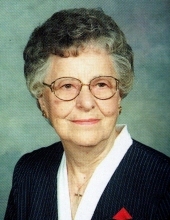 Arvilla was a faithful member of her Lutheran churches. She loved children, and children loved her company. She hosted many birthday, holiday and special occasion parties and enjoyed sitting for many nieces, nephews, great-nieces/nephews and grandchildren. She also enjoyed playing cards with friends, spending holidays with family and visiting with neighbors. To send flowers or a remembrance gift to the family of Arvilla A. Beccue, please visit our Tribute Store. "Email Address" would like to share the life celebration of Arvilla A. Beccue. Click on the "link" to go to share a favorite memory or leave a condolence message for the family.